Photo by Tom Rivers: Save Ontario Shores members had a float during the Lyndonville Independence Day Parade showing their opposition to the proposed Lighthouse Wind project. The table below shows the results of an empirical assessment of public comments made to the DPS website in relation to the Lighthouse Wind Project as proposed for the Towns of Yates and Somerset by APEX Clean Energy. All comments made to the DPS site regarding the Lighthouse Wind Project were included in the assessment and cover the time period from January 1, 2015 through June 30, 2018. All comments were read fully in order to ascertain position regarding the industrial wind turbine project. The positions were tabulated as in favor of or opposed to the project. 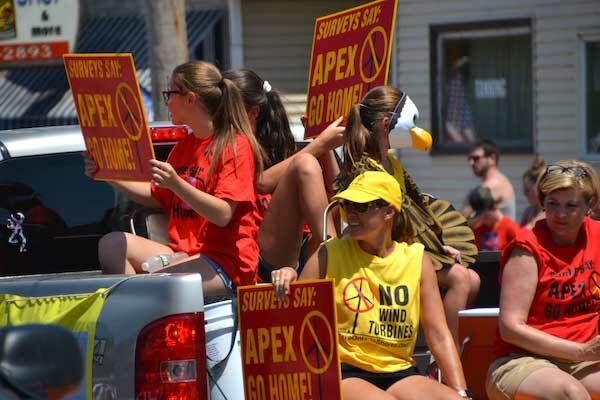 For over three years, the results continue to show overwhelming opposition to Apex Clean Energy’s Lighthouse Wind Project.